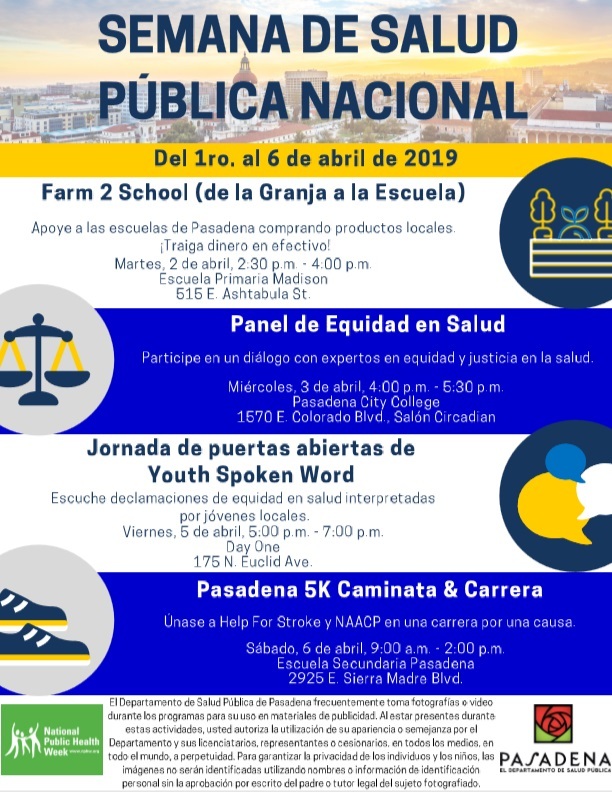 PASADENA, Calif.—Pasadena Public Health Department (PPHD) invites the public to participate in National Public Health Week events April 2-6, 2019. National Public Health Week is a celebration of public health successes and an opportunity to focus on prominent public health issues. This year’s National Public Health Week theme is health equity, which is the idea that every person deserves the opportunity to live a healthy life. To ensure health equity for all, we must work together to remove barriers to good health. 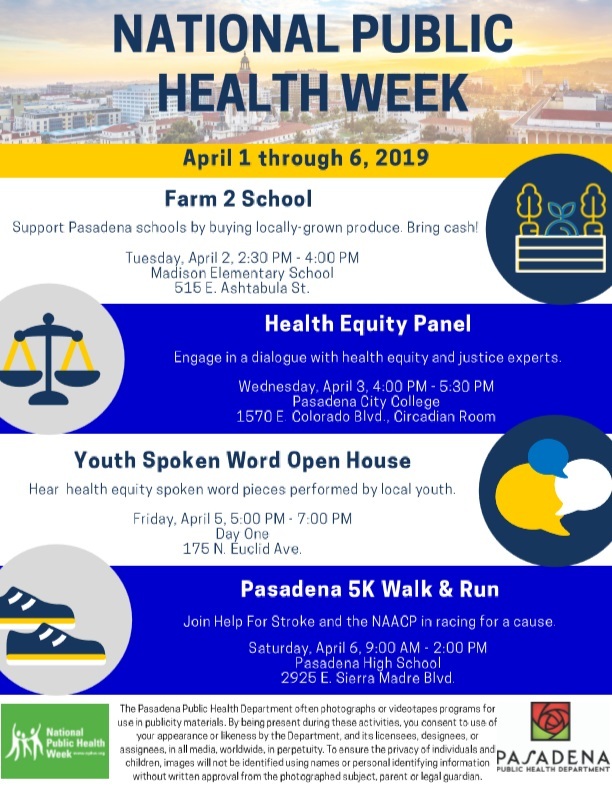 Join PPHD and our partners across the City for the following National Public Health Week events, and learn how we are working to ensure health equity for every Pasadena resident. Events are free and open to all ages; participation in the 5K race is $40. For more information, contact Judith Dunaway at jdunaway@cityofpasadena.net. Support the school by purchasing fresh produce and learn about programs that work to increase food access and improve healthy eating behaviors. Improve health equity by removing the social barriers to good health. Join experts in the fields of criminal justice, immigration, housing and education to discuss how these life experiences affect health. Friday, April 5, 5 – 7 p.m. – Day One, 175 N. Euclid Ave. Hear selected submissions to the Youth Spoken Word Contest. Pasadena youth bring a unique perspective to the future of health equity. Winners of the contest will be announced and local agencies will participate in a resource fair. Saturday, April 6, 9 a.m. – 2 p.m. – Pasadena High School, 2925 E. Sierra Madre Blvd. Join Help For Stroke, the National Association for the Advancement of Colored People (NAACP), and PPHD in racing for a cause. Visit www.helpforstroke.org for registration information. Race registration fee is $40. There is a free health and fitness expo following the race. Since 1892, PPHD has worked to promote and protect the health of the greater Pasadena area. Learn more about PPHD at www.cityofpasadena.net/public-health.